In 1950 ice was delivered to our house once a week by a man in a horse drawn carriage. A modified covered carriage with car tires and also drawn by horse brought us our milk, butter and cream. In the second grade I have a lasting memory of having our class taken by a man with a large camera on a tripod. The light was literally a flash in the pan. It was magnesium. My first contact with a TV was in the house of the daughter of the head of GM in Argentina. I did not have a phone at home until I was 14. I was a passenger, many times in Douglas DC-3s, DC-6s and a Lockheed Constellation. People were taken to the cemetery in beautiful black enameled carrozas (in Argentina we called them pompas fúnebres) drawn by four horses. The men, four of them had black top hats and I could spy the coffin through beautiful glass with beveled edges. My house was a block away from a big hospital. The carroza passed empty in one direction and full on the other. The horses clopped on the cobblestones and I remember those black plumes over their ears. The above is ample proof that I am a product and a man of the last century. I am now in the wrong end of a confusing segment of my life. I am not ready to put my head into the ground like an African ostrich. Sometimes the 20th century returns in little fun occasions. One such occasion happened on Wednesday. 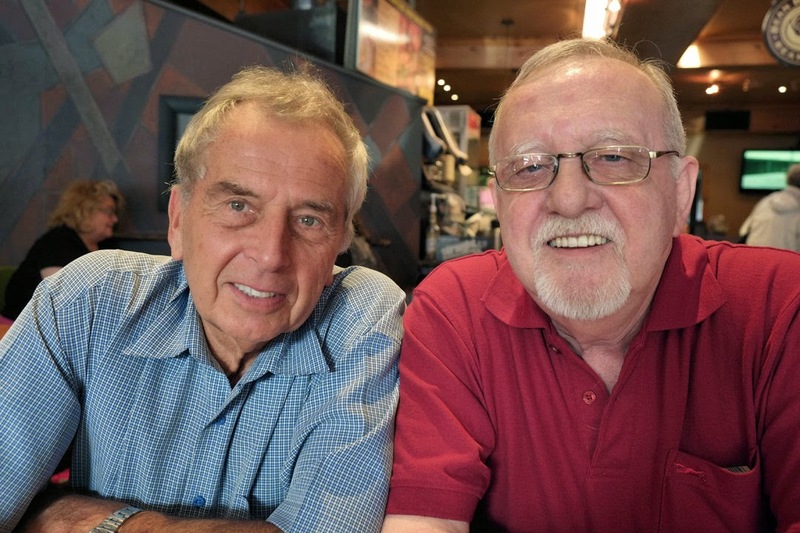 At one o’clock I met up with Horst Wenzel and Guy Berthiaume for lunch (two deluxe pizzas) at Bean Brothers in our nearby Kerrisdale village on 41st Avenue. Both Horst Wenzel, 75, and I, 72 brought show and tells. Guy Berthiaume, 69, brought his French Canadian charm. Wenzel repairs cameras with a skill that it so much in demand and lacking in so many countries that he has more work than he can handle. He keeps my mechanical cameras operational. Berthiaume until not too long ago was the most pleasant and patient counter man at Kerrisdale Cameras (still there across Bean Brothers). He gave me good advice and sold me some good equipment. 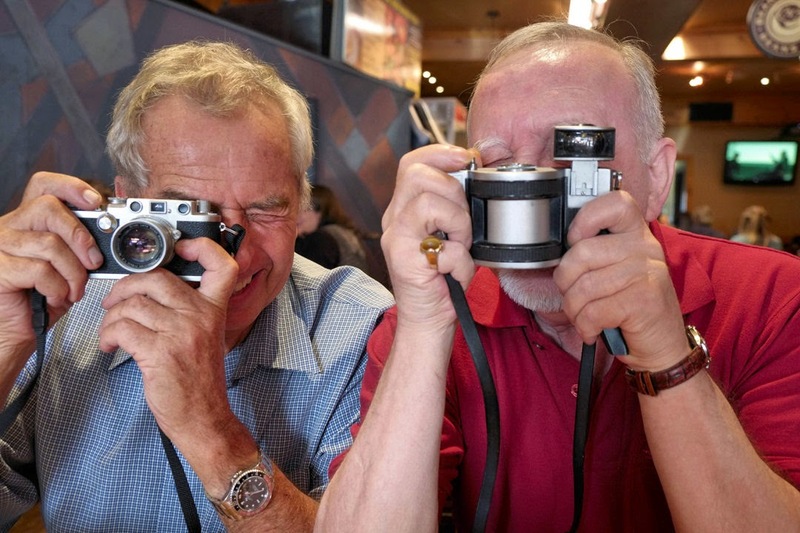 What I did not know is that people like Berthiaume and Wenzel have, because of an obvious accessibility, a penchant for collecting cameras that soon enough become a problem with dusting wives (remember that since these men are from my century a dusting wife is not an anachronism). We talked solid about minute differences between camera A and camera B. I brought several cameras including the two you see here. One is a Leica IIIF the other a Russian swivel lens panoramic called a Horizont. Wenzel is now doing extra money painting cameras (Leicas) from all over the world in brilliant colours including one to replicate the colours of the American flag. Such was the pleasure of our long chat that we have decided to bring back the 20th century once a month.